William Nicholas Funeral Home & Cremation Services,L.L.C. 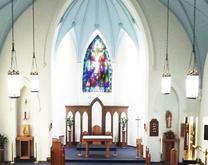 We are St. Stephen Church in the Roman Catholic Diocese of Youngstown. Since 1853 we have served the community of Niles. Through our Baptism, we are called to build our lives in the image of Christ through worship and prayer, in Word and Eucharist. Together we draw others close to God through our service, charity and evangelization. In a spirit of stewardship, we share our time, talent and treasure with the faith community and for future generations. Saint Stephen Roman Catholic Church, situated in Niles, Ohio, formed in 1853, is a loving, caring family of welcoming people whose rich tradition of faith is rooted in the Eucharist. Actively living the Gospel, we share our faith and hope with all the people as we journey toward the kingdom of God. One of the richest blessings of our Saint Stephen parish family is our strong sense of tradition. From our original founding as a parish community Saint Stephen has been the parish home for generations of families who take great pride in our faith and the sense of tradition that has permeated our history. We are always welcoming new families to join us in faith. Whether you can trace your lineage back to one of our founding families, or you are new to our community, there is a home for you at Saint Stephen parish. Thank you for visiting Saint Stephen Church.